Mui Ne (Mũi Né), Phan Thiet (Phan Thiết) is not only ideal for sightseeing, swimming, but also for eating. This is the heaven for seafood lovers. After all, the main source of daily income for local people here is still from fishing in the Sea. Of course, in coastal towns, the main dining scene is still dominated by local seafood. However, what make dining experience in Phan Thiet – Mui Ne different from other coastal towns lies in the price and the quality – cheaper and better. With a lot of restaurants, cafes, clubs and bars here, Phan Thiet – Mui Ne will not disappoint any food lover upon visiting the beautiful city of Phan Thiet. You can easily find traditional Vietnamese dishes, and other Asian specialties, Italian and French foods here. Now you may want to know great ideas for the best Phan Thiet -Mui Ne restaurants so you can perfectly plan your upcoming trip to Phan Thiet – Mui Ne in advance. Check out the following suggestions that are collected from experienced tourists! Among Phan Thiet – Mui Ne restaurants, the most well-known might be Vietnam Home 1 and 2. This restaurant was opened in 2009 and it offers some best home-style Vietnamese cuisine along the strip of Phan Thiet – Mui Ne. 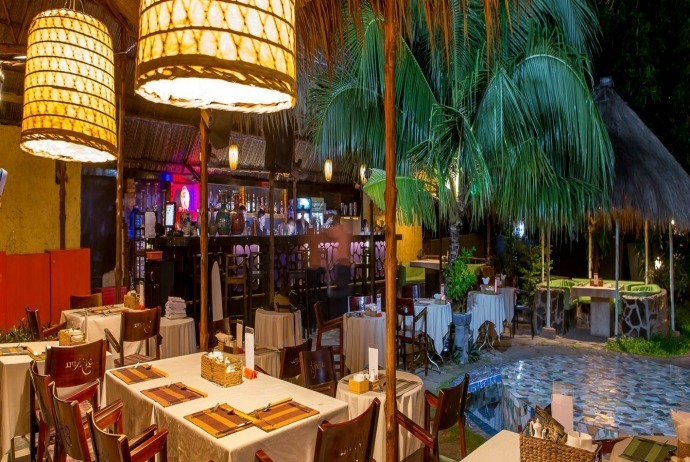 Housed in a traditional-style, airy Vietnamese thatched establishment, this restaurant has a wide array of both Vietnamese and international dishes and is considered one of the most favorite Phan Thiet – Mui Ne restaurants for tourist groups visiting this area. This is an ideal option for those who want to enjoy crocodile and stuffed sea lizard or snails. If you do not have any specific choice of food before coming to this restaurant, then you could opt for one of dishes set in the menus. There is a buffet full of crocodile dishes every Thursday of the weeks, and a wide range of affordable wines to help to complete your great meal. The restaurant’s ground floor has open and covered seating while the first floor has pleasant terrace. There is a souvenir shop in this restaurant, which sells crocodile-skin products as well as other interesting items. It is definitely worth a look. Vietnam Home has two branches, which are Vietnam Home 1 and Vietnam Home 2. The second branch is further west along the Strip at the number 53, Nguyen Dinh Chieu that offers similar dishes. 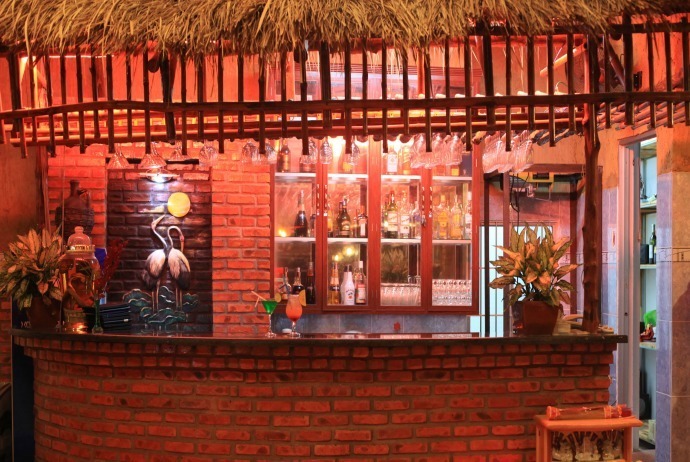 The upper floor is set with the same thatched style, so it is really ideal for a delight cool breeze. Belonged to the Mui Ne Hills Resort, this restaurant-and-bar place is quietly situated about 300 meters off the Ham Tien – Mui Ne Strip. Customers can taste wine and dine around the swimming pool and enjoy the great views of palm trees and Mui Ne Bay. Breeze serves delicious breakfast, lunches and dinners, both in Vietnamese and Western styles. Each night, there is a DJ who offers background chill-out music whilst you enjoy tasty dishes served by attentive staff. Also, they serve fresh seafood which is well prepared on the barbecue. There is also a wide selection of wines, freshly squeezed fruit juices, and cocktails. 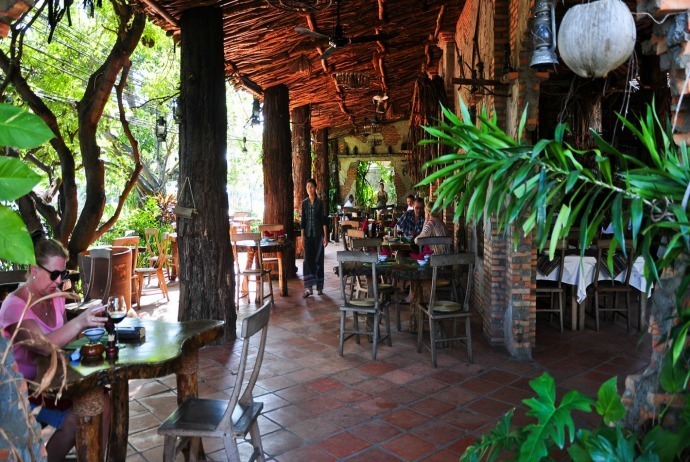 This quiet, cozy restaurant is located in the lush tropical garden of Cham Villas. It is a perfect site for those who want to find somewhere to enjoy a romantic evening dinner. With an extensive menu that includes both traditional Vietnamese and international food, Cham Garden restaurant is definitely one of the most worth-trying Phan Thiet -Mui Ne restaurants. There are also some creations that greatly fuse elements of Asian and European cuisine. To round off your evening, you can feel free to choose from a large selection of tropical cocktails in order. 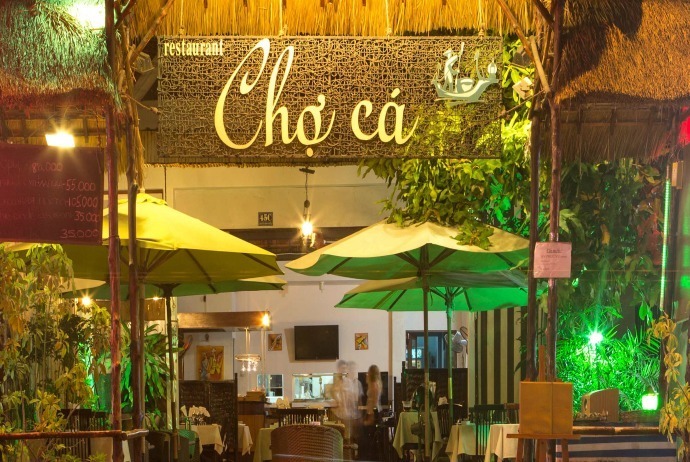 The restaurant is set in an outdoor, leafy venue, and serves up a great barbecue with various dishes from traditional Vietnamese street foods to seafood. Among Phan Thiet -Mui Ne restaurants, it is the only one which has a live traditional Vietnamese cultural show each night of the week. Dancers here dress authentic Cham costume. Skilled musicians as well as singers entertain the customers and audience with a medley of traditional and modern songs. The outside area is an ideal place for families with kids. 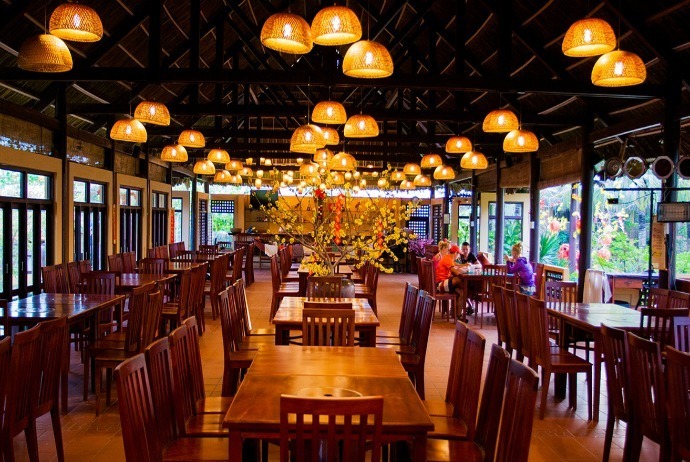 It is a beachside restaurant, which is a part of Long Son Mui Ne exotic restaurant and resort. It serves traditional Vietnamese cuisine with classical Vietnamese opera performances. 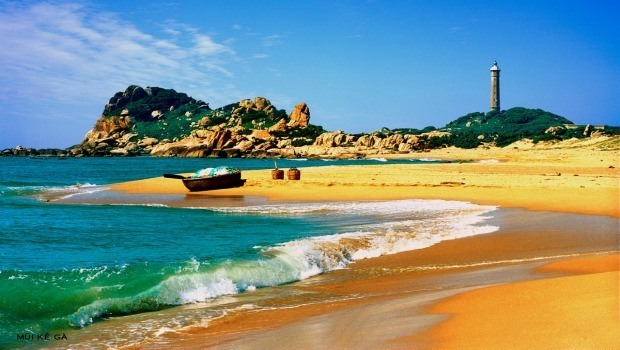 It is well-known for the most delicious hotpot and grilled seafood at the finest beach of Mui Ne. There is a beachfront campground which is shaded by coconut palms and usually used for many team-building events. This resort often organizes traditional local events and cultural activities. The restaurant is own and run by the same people as Tamago Japanese restaurant adjacent. This is the spot for those who want to enjoy refined Vietnamese home cooking. Specializing in barbecue dishes and hot pots, Red Charcoal provides guests with traditional food from different areas of Vietnam, including northern, central and southern area. Particularly, the prices are very reasonable for tourists. You can easily bring your children along when enjoying food at this family-oriented restaurant as there is a play area. Deja Vu will give you chance to enjoy a sensory night of live rock and jazz every evening, with legendary covers of great artists like Louis Armstrong and Elton John. There are five seating areas, which let you opt for the environment fitting your mood: a cozy art room with pool table, a peaceful rooftop hookah table put under the stars, a tropical garden with the playground for kids outside, an outside yard, and an indoor space with home terrarium and air conditioning. For lunch, Déjà vu features 3 course meal containing soup, salad and a main dish with garnish along with free ice tea. The staffs here are very attentive and can speak English. They will proudly present to you a medley of cuisines, including live seafood, Russian, Vietnamese, European and even exotic meats such as scorpion, crocodile, and more. The average price of dish here is about VND100,000. If you are a person who loves to enjoy wines, then there is always a wide selection of both old and new wines available for you and a special menu for kids. A representation of 9 dishes which showcase the variety of Vietnam cuisines. During the Vietnam Night, customers can try on the national costumes and take photos with folklore heroes of Vietnam. You should buy tickets and book tables in advance to get the best dining experience. 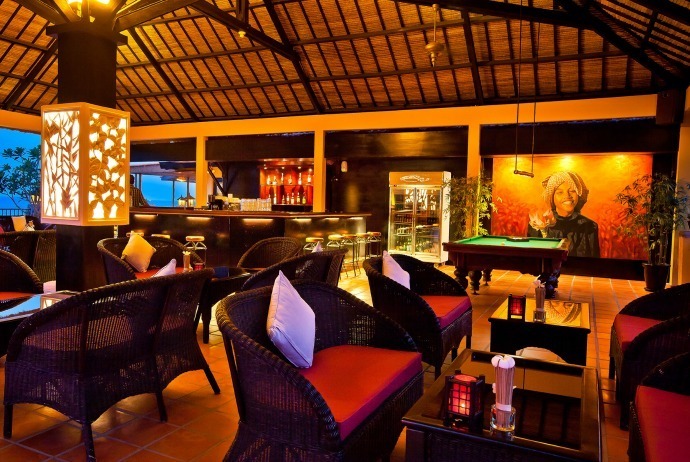 Other offers of Deja Vu, apart from the everyday live music, include a cozy rooftop shisha room, a cute, romantic garden with summer houses, and a fun playground for kids. The cuisine served in Deja Vu includes Vietnamese, seafood, European and exotic dishes. Situated beside a fishing village of Mui Ne, Golden Sail specializes in traditional Vietnamese food with fresh seafood as well as Asian and European dishes. When coming to this open air restaurant, you can not only enjoy great food but also enjoy the cool ocean breeze. This restaurant also runs different tours of the Fishing village. Having Vietnamese and Western dishes cooked right in front of your eyes, at your table is a great idea for the best dining experience, right? In this romantic establishment, located centrally in Ham Tien, Cho Ca Restaurant serves seafood, and the Russian proprietor ensures the best possible pelmeni in the town. You can ask about a cooking master class. Experienced tourists suggest you trying sliced prawns rolled in bacon with lemongrass sauce. Among Phan Thiet -Mui Ne restaurants, Cay Bang Restaurant is one of the most relaxing ones that provides guest with a fresh experience. With an oceanfront view, Cay Bang restaurant has extensive menu. It is located at the edge of a resort strip. Though the restaurant is rather quiet and popular among local people, spacious interior could easily host larger parties and conferences. After enjoying a great meal, you can step down from Cay Bang and hit the beach. Such a comfortable break after a long day of discovering Phan Thiet – Mui Ne attractions! 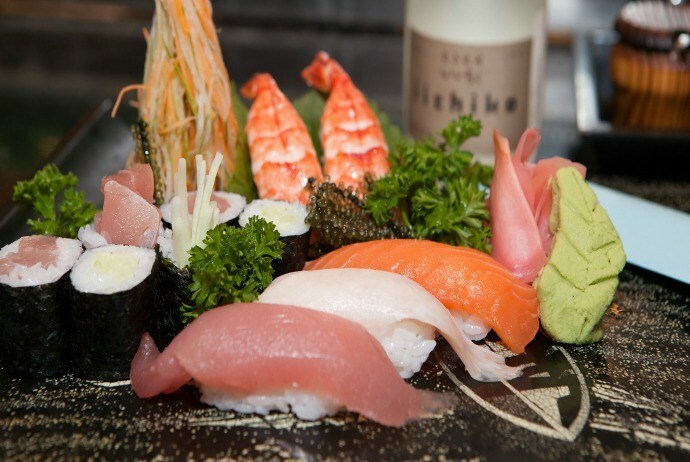 A slice of Japan on Ham Tien – Mui Ne Strip, Tamago is considered the only “Real” Japanese restaurant in town. Other places may offer some sushi, but Tamago is the only site that offers a full deal with a wide array of Japanese dishes, from maki and sashimi to okonomiyaki and ramen. If you are a vegetarian, then don’t worry because there is a special menu for you. All ingredients are imported from Japan. The simple but polished decoration of Tamago Restaurant is a good reflection of the refined and clean tastes that guests will find at Tamago. Inside, the cozy seating with private rooms will satisfy any guest. The restaurant stocks a large amount of beer and sakes. Tamago Japanese Restaurnat is open from 11 am to 11 pm. On Sunday, there is a buffet lunch. Thursday night is a yakitori night. As mentioned earlier, Tamago restaurant is owned by the same people like the next door restaurant – Red Charcoal. If you are looking out for a Thai meal which also offers you a chance to enjoy the nature of a coastal town like Mui Ne, then Sukhothai Grill is your choice. It is reputed to serve the best Thai dishes, apart from delicious Vietnamese and European dishes. The cooks here choose just the best ingredients for their cuisine. The Thai dishes well prepared with genuine Thai ingredients will give you a real taste of Thai Cuisine. Just the freshest seafood as well as oysters is served here. To makes sure that the quality of dishes are at the best condition, food must be ordered 24 hours in advance. Situated on the beach, Sukhothai Restaurant is well-known for grilled cuisine, particularly the various whole grilled fishes and its flavorful, tender and juicy grilled lamb and beef, and tasty Asian Cuisine, particularly Vietnamese and Thai. 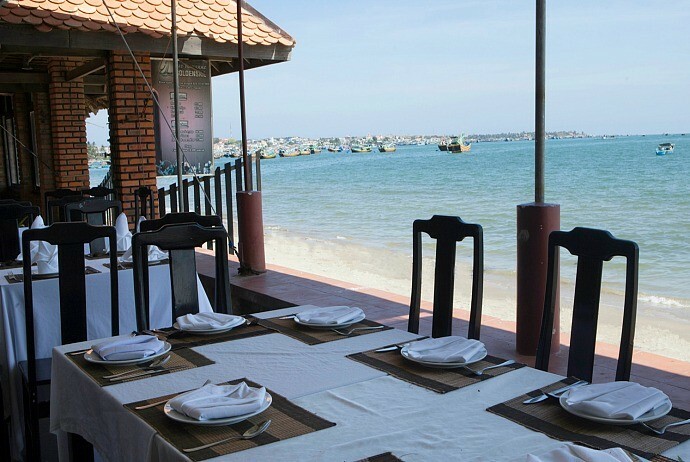 This restaurant is established on comfortable, large which allows people to observe the beautiful scene of Mui Ne beach. You could enjoy the spectacular view of sunrise in the morning while still enjoying your breakfast. The restaurant always ensures that guests will have a relaxing and pleasant time with professional, dedicated service for every guest. The wine list is extensive, including red wines, white wines, rose wines, champagnes, and sparkling wines. The food menu is also various, with wide range of dish choices, such as fish and seafood, rice and noodles, meat and poultry, pastas and pizzas, veggies and potatoes, sandwiches and dessert snacks. The ambiance here is great and the service is friendly and professional. There is a wide range of beers, cocktails, and coffees from all around the world. Looking out over the beach lined with palm trees, Sukhothai Grill is reputed to serve the best Thai food in the area, but it also does tasty Vietnamese and European dishes. Chilled-out tunes stream throughout the restaurant while you enjoy the magical coloured lighting, floodlit pool and occasional torches on the beach. The ambience is wonderful, and the service professional and friendly. Sukhothai also has a wide range of cocktails, beers and coffees from around the world.Sukhothai Restaurant is part of Sunsea Resort. 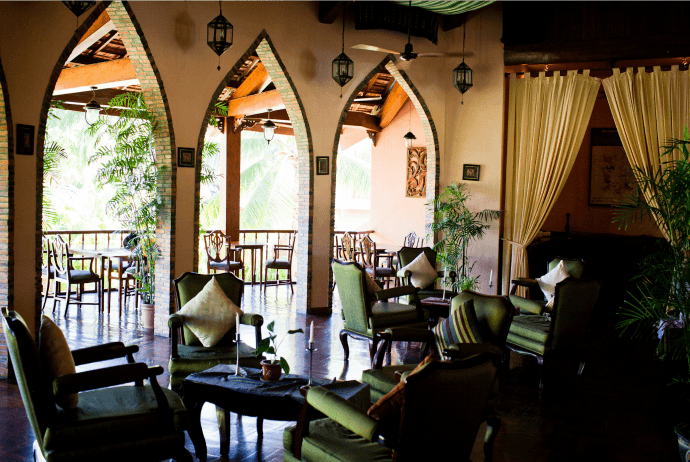 It is an Indian restaurant that provides guests with real Indian dishes in Mui Ne. The food here tastes Indian yet is rather oily. The Naan, butter chicken and vegetables are good options for you to consider if you have no idea of dishes to opt for. Shree Ganesh in Phan Thiet – Mui Ne is one of the branches of this brand in Vietnam. Other branches are in Ho Chi Minh City, Phu Quoc, and Hoi An. This classy and quiet restaurant has professional service with friendly staffs. Owned and run by Cham Villas, Ratinger Löwe is a cozy restaurant which serves great German dishes. It might be the best German restaurant in Vietnam with professional German chefs, professional service, attentive staffs and pleasant ambiance. Nice wooden tables and comfortable setting are special features that contribute to the popularity of this café-style restaurant. Here, you can easily your favorite wines and dishes from an extensive menu. Particularly, thanks to the wide selection of imported German beers as well as fresh tropical cocktails, the restaurant attracts a lot of young guests and expats. The name “Ratinger Löwe” means “Ratingen Lion”. One of the owners of this restaurant was born in Ratingen and was considered as the “culinary ambassador of Ratingen city to Phan Thiet”. 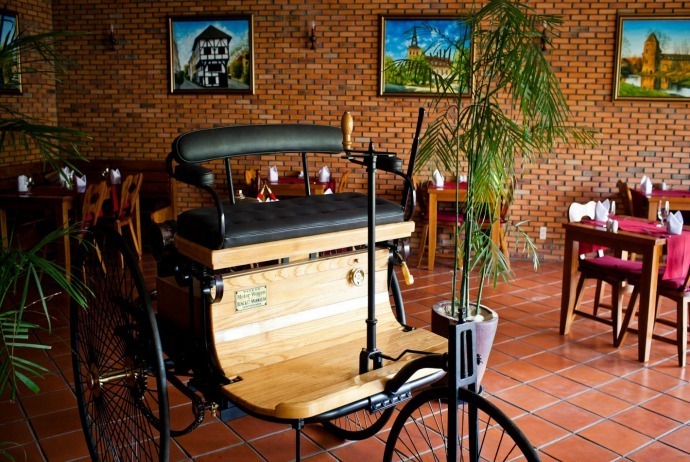 The last one in this list of best Phan Thiet-Mui Ne restaurants is Santimatti. This is an Italian restaurant which offers great Italian flavors served in such a comfortable open-air environment. Pizzas and fresh pastas get the top recommendation when it comes to dish choices. The upstairs terrace is part dining area, part gallery. For fine dining, there are numerous choices for you to consider in Phan Thiet – Mui Ne. With a selection of seafood and international taste cuisine and an extensive wine list, I bet that the Phan Thiet – Mui ne restaurants mentioned above will definitely not let you down. Trust me, these restaurants will surely make your journey at Mui Ne, Phan Thiet, Vietnam much more impressive and unforgettable.